Few creatures evoke the fear and wonder that dragons do. Even their smaller kin, the drakes, drive people and animals alike to scatter for shelter and avoid the notice of these keen-eyed hunters of the skies. Their majesty and their inherent cruelty make dragons and drakes even larger than life in song and legend. Tales abound of dragons’ treasures and of those brave heroes who would beard the monsters in their lairs, whether to plunder a hoard, save a captive, or put an end to the beasts’ vile depredations. Such tales paint dragons as easily defeated, but in truth they are no cringing beasts to be cornered and slain. They fight with terrifying ferocity and deadly cunning. Dragons have nothing to fear from would-be heroes—as the twisted bits of armor and weapons decorating their lairs testify. Of Fire and Venom reveals the secrets of dragons, drakes, and similar creatures, offering new options for customization and new variants with which you can torment the player characters and frustrate their plans. 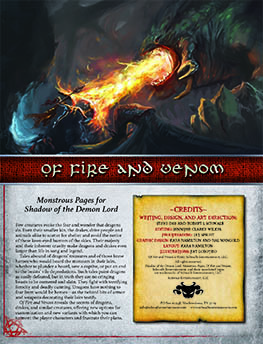 Buy Of Fire and Venom as a PDF from Schwalb Entertainment or DriveThruRPG!